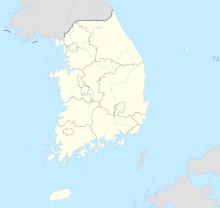 Donggeochado, Donggeocha Island, or East Geocha Island, is a 2.91 square kilometres (1.12 sq mi; 291 ha) island east of Seogeochado in the Geocha Archipelago in South Korea. It is part of the Dadohaehaesang National Park, and the waterway Maenggol Channel. Administratively it is located in Jindo County, South Jeolla Province, in the administrative division of Donggeochado-ri, Jodo-myeon. On 16 April 2014, the passenger ferry MV Sewol capsized north of the nearby island Byeongpungdo, drifted north while taking in water, and sank off the coast of Donggeochado. ^ Ralph Ellis, KJ Kwon and Greg Botelho (2014-04-20). "Transcript: Passengers couldn't escape South Korean ferry, crew member says". CNN World. ^ "Gov't to give locals financial aid". Korea JoongAng Daily. Koreajoongangdaily.joins.com. 2014-05-13. Retrieved 2014-06-13. This South Korea location article is a stub. You can help Wikipedia by expanding it.